Have you heard? We have a new microneedling treatment at Boston Plastic Surgery! It’s called Vivace™ Fractional Microneedle RF, and it’s fair to say we haven’t been this excited about a skin rejuvenation technology in quite awhile. Vivace is an FDA-cleared treatment that combines the latest generation of microneedling technology with radiofrequency (RF), a proven non-invasive skin tightening method, and LED light therapy. This powerful treatment quickly and effectively reduces fine lines, scars, stretch marks, and other blemishes—in addition to lifting and firming mild skin sagging and restoring an overall smoother, more youthful appearance. Learn more about how microneedling works with Vivace. Three factors unique to Vivace help it work faster than other microneedling options. First, integrated RF energy accelerates collagen production and skin tightening. Second, LED light calms inflammation and speeds healing time. Third, the gold-tipped needles create invisible “microchannels” in the skin that are extra receptive to the nutrient serums applied during treatment. These serums “feed” your skin with key nutrients to help rapidly rebuild new collagen and elastin. Most patients notice significantly smoother, softer, and younger-looking skin, as well as improvements in skin tone and texture, after just one treatment. This means we can achieve optimal results after only three sessions (most other microneedling options require up to six treatments). 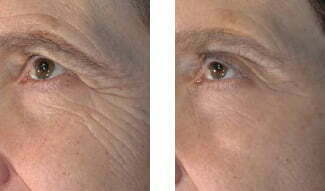 Before & after three Vivace treatments, courtesy of Aesthetics Biomedical, Inc. Older microneedling technologies that use a roller or pen can tear skin during treatment—and that hurts. Vivace uses superfine, insulated, gold-tipped needles that enter the skin smoothly and evenly with no tearing. A numbing cream applied about 30 minutes before treatment is all you should need to stay comfortable. We also apply a soothing mask immediately after treatment to help cool the skin and minimize redness. Vivace’s superfine needles and robotic-assisted mechanism result in an exceptionally precise, even treatment with little-to-no bleeding. Built-in LED Light therapy minimizes post-treatment redness, too. While we ask patients to wait until the next day before applying makeup, most feel comfortable going out without any makeup. Of course, you’ll need to apply broad-spectrum SPF after microneedling to protect treated skin from the sun. While microneedling already helps firm skin texture, the addition of RF energy takes skin tightening to another level. That means Vivace is an excellent, downtime-free option to tighten mild jowling or sagging skin around the eyelids, cheeks, or neck. If you have stretch marks, you likely know how hard it is to find an effective treatment for them! The collagen-building “power couple” of microneedling and RF helps strengthen and improve texture of stretch-marked skin. It also helps with other common texture flaws, such as acne scars and large pores, restoring a smoother, more even appearance. We can adjust the depth of Vivace microneedling to safely firm and smooth thinner skin on the hands, neck, and chest, which are often in need of a little rejuvenation too. We’re so sure you’ll love Vivace that we’re offering incredible introductory savings on our most comprehensive Vivace microneedling package: 10% off a three-treatment series, plus we’ll include HydraFacial treatments to boost your glow between Vivace sessions and a Boost-Glide Serum & Enhance Weekly Mask on the house. See our specials page for details. Ready to try Vivace? Here’s how to get started. Our experienced Skin Wellness Center team has been performing microneedling in Boston for years and, in our professional opinion, Vivace has truly taken this proven skin resurfacing treatment to a new level. We can help you decide if Vivace is right for you at a personal skin evaluation and consultation. Call 617-786-7600 or contact us here to make your appointment.